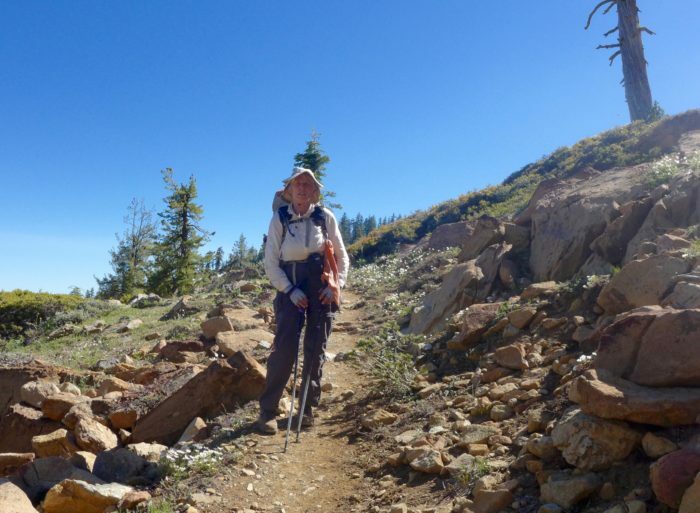 Does it matter how old you are when you hike a long trail? I recently returned from two weeks—12 days with a few zero days—on the Pacific Crest trail. I hiked 180 miles. I am 70 years old. It was my second two-week venture on the trail this year. No one tells me I’m too old to do this when I’m on the trail. Young hikers on the trail talk to me and don’t ask how old I am. We talk about trail details, such as upcoming snowfields, water sources, exposure to sun. Every passerby greets me, often taking time to chat for a while. Only once, when I asked about an upcoming water source, the young hiker looked at me and said, “I don’t think you should go there, no you shouldn’t, too steep of a snowbank to get to the water.” I don’t know if he meant I was too old or too fragile to attempt climbing down a snowbank, but I did feel his concern for my safety. He gave me a liter of water he had just collected. I rarely see my image when I’m on the trail and I forget what I look like. While hiking I’m predominantly in feeling mode, i.e. my body, my muscles, my feet, my exposed skin (what little I let be exposed), the weight of my pack. I get up in the morning, stretch, start moving, crouching, bending and within no time my camp is packed up and I’m walking, swinging my legs and arms, carrying my belongings. I’m no different from any other hiker in this respect, young, middle-aged or old. Hiking levels the playing field of living for all. I train before I go on a long hike, I hit the trail strong and ready to hike and carry, 14-15 miles a day without ill effect. Maybe that’s the difference between being old and young: I train before I go the distance; I cherish my body and I hate pain. I hear the younger ones complain about their feet, their shin splints, a stress fracture, their back, disappointed that their bodies are letting them down. I wear my knee support, let my pack pull my back straight, so I don’t feel my bulging disc, put on my slightly heavier but supportive hiking shoes and I’m off on my hike. I don’t swallow vitamin “I” as they call Ibuprofen to deal with the pains of hiking. My shoes are big enough so that I don’t get blisters. I enjoy walking without pain, I rest when I’m tired, I hike an eight-hour day. Society puts us in categories, age related categories, status related categories, place related categories, skin color related categories. On the trail you’re part of the trail society as long as you can walk and carry, no matter what your age, your skin color, or your financial circumstances. Our possessions are simple, a pack, a sleeping bag and pad, a shelter (or not), cooking equipment, a few clothes, food and technology for navigation and entertainment. The goal is to carry as little as possible, the goal is to have LESS rather than more. Transportation is the same for all of us: we use our legs and feet. 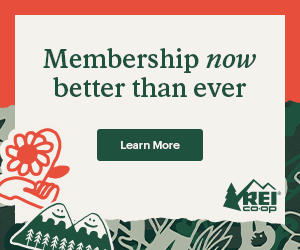 Young, older, or old, we have our reasons for being on the trail. We ask each other sometimes, the answer changes as the trail changes us. At age 26 I hiked to reach Mt Everest Base camp. At 70, I hike to live. I don’t hike the big miles. I surprise myself when a 20 mile day happens. I don’t have an end goal except to get to the next supply stop before my food runs out. I just go out for a few weeks, hike, take in the sights, have an adventure and loose my age on the trail. Very inspiring indeed. 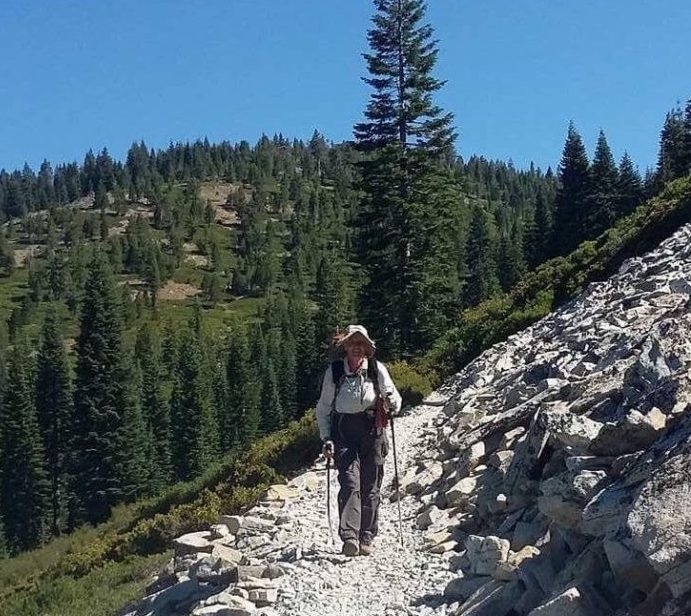 At 70 , you can still carry your backpack and walk 20 miles each day. You keep me courage to trek solo. I am soon reaching my retirement age at 60. I intend to trek and meet trekkers of the same minded people. God bless you! I can’t hit the trail for an extended period of time until I retire 8 years from now. Thank you for writing about your experiences and motivating those like me. I was working still when I started hiking the PCT. I was able to get a 3 week vacation. I trained on my weekends and hit the trail hiking an average 17 miles a day. The distance doesn’t matter, how your body holds up matters. Train, train before you put the long miles on! I am 54 and your bog post really spoke to me. Thank you for inspiring me to train a little better and to enjoy the miles. Glad I can inspire you! Go, one mile at a time! Dami, Your sage perspective comes with years of life, maturity, and most importantly — a knowledge of who you are. You are not out to make a name for yourself, impress anyone, or create a story. Your hike is exactly yours; not anyone else’s hike set to “make a statement.” I absolutely love your perspective because it simply does not exist in the majority of those who post here. I hope you on day decide to write a book on what your hiking purposes are, what your experience has been, and what you would like to say to those half your age. I know you don’t have an agenda. But the essence of what you are saying at your age is vitally important to those just starting out. I tip my hat to your wisdom and purpose on the trail. David, Thank you for your appreciative perspective! Actually the book, “Walking on the Wild Side” is almost written, just going back and forth with the publisher. Will be published this fall. If you sign up on my website you will be notified when it comes out. Wonderful thoughts – thanks so much for sharing .As I head out for four different types of walks – over the next 2 months – one of which is a week on the Crest trail you inspired me and encouraged me to consider doing a solo next year .I am a long time hiker and mountaineer and love to be out there in the wild but these knees keep screaming at me – you quieted them down for a while ! Keep posting and hiking ! Off again gorgeous day ! Bravo! Thank you for your inspiring thoughts. I will be on my little section of the PCT at 0600 Thursday thinking about you. Dami- I just read your article and loved it. You are an inspiration to so many! When does your book come out? You really made my day ! More than day I am sure!! Just take one step towards something new everyday! Nice. I hope I can be like you in 23 years. Dami I am 70 also and started hiking a couple years ago. My age does worry me, but I am in reasonably good health. Your perspective is awesome and your wisdom is really welcoming to me. Hike on ! Young lady ! Worrying about your age doesn’t help with hiking. Putting one foot in front of the other, hauling that pack will determine more how you feel about yourself. Thanks for this article! I completed the AT (2003-04) and have since vacillated between total sloth and training for section hikes. Now that I’m 43 I’m acutely aware of my body as it changes over time. What I choose to do NOW will impact my ability to hike and adventure later. You are an inspiration! t for you anymore! Stay active and you’ll be in the best hiking shape YOU can be when you get older. Do what you like, train in something that has your interest. Wow, top notch article full of perspective for hikers of all ages. The time spent on preparation is notable, and the caution to buy shoes big enough and supportive enough is right on target. Thanks for a well written, thoughtful and thought provoking story. Good luck with your next hike, and I look forward to your next article. Great article. Puts into words how I feel out on the trail. At 66 yrs. I can still put in an occasional 30 mile day if needed but ,yes training and enjoying conversations with folks on the trail are keys to a great trip. i’ll be soloing the CT this coming summer before heading to Italy to do some via ferrate. Gotta keep moving!! I am 58, and last year I did my first12 days thru-hike, this year 17 days, and now I have heard about the PCT. I really want to do it, but am a bit hesitant because of my age and never before have hiked with a tent and cooking facilities on my back. And then these bears and snakes. Your article makes me optimistic that it is manageable. I attempt to do it in 2021, after having retired. Till then I plan to do at least one hike a year of at about 4 weeks or more. I also want to work on my gear every time. Well I am glad I found your blog! Thank you so much! You have underlined my goal to thru hike SOBO. I’ll be 69 when we go in 2020, and have moments when I question how wise it would be,lol! In reality, I am pretty active, fsrm wife and martisl artisy, lifelong hiker. Just Thanks againfir the inspiration!